On Monday, President Enrique Pena Nieto signed into law a framework for private investment, ending a 76-year state monopoly. Days later, and earlier than expected, his government made a key announcement about what areas of Mexico's vast reserves would be open to foreign oil companies. State energy company Pemex is being awarded 83% of known and probable reserves. Pemex hopes the grant can help it boost dwindling production levels. But crucially, the company was only granted one-fifth of Mexico's future potential oil and gas reserves. The rest will be put up for auction, starting next year. Pemex had wanted to receive more without the need to compete. "Of the prospective resources, we have received indeed 67% of what we asked for," CEO Emilio Lozoya told CNN. "But that is plenty for the next decades. And Pemex will be able to bid in round one, round two, round three when the government auctions acreage for exploration." The scene is set for a hotly contested auction: In addition to shale gas, bidders will be vying for the estimated 27 billion barrels of oil deep beneath the Gulf of Mexico. Mexico's side of the maritime border is largely unexplored and has no oil in production -- a striking contrast to the level of activity in US waters. Pemex has been granted a slice of the deepwater game, and intends to bring in partners with expertise in drilling up to 3,000 meters below sea level. "We will create a competitive environment, therefore I cannot name players today," said Lozoya. "But what I can tell you is we will be wanting to work with world-class players." One obvious candidate is Exxon Mobil (XOM), the world's largest public energy company, which broke its silence this week to hail Mexico's "historic" changes. "We will pursue potential investment opportunities in Mexico that are competitive with other opportunities around the world," the corporate giant told CNN in a statement. Partnering with such a major player may also inject greater transparency into Pemex, currently the world's seventh largest oil producer. While the firm is modernizing, it is still struggling to shed an old image of an opaque and sometimes corrupt monolith. "Competition means we will need to partner on projects," said Lozoya. "This is a great benefit to our organization." 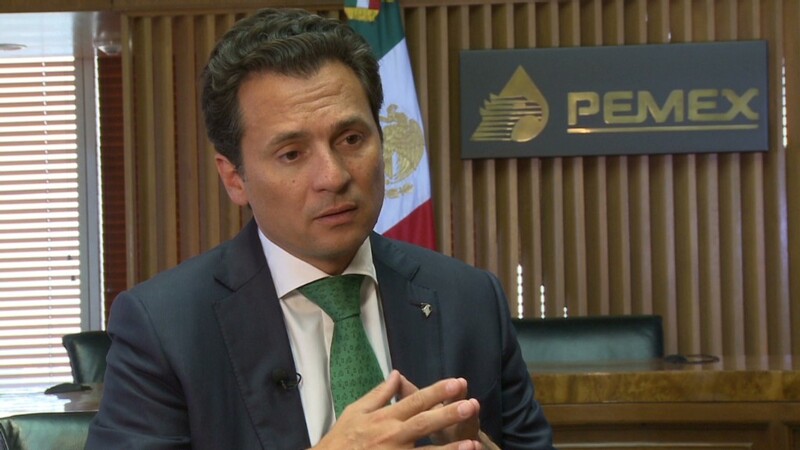 Lozoya believes large private companies will ensure Pemex isn't overpaying. "They will make sure we minimize costs and therefore maximize profits," he said.